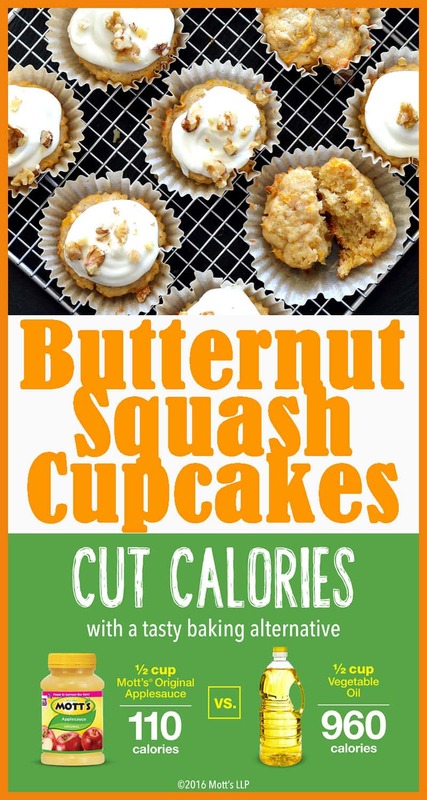 This recipe for Vegan Butternut Squash Cupcakes with Maple Cream Cheese Frosting is so much fun! I created a cupcake, not dissimilar from a carrot cake, and exchanged the carrots for grated butternut squash. I also made a few swaps (as I always do) to veganize the recipe. Where oil normally would have been, I chose my favorite all-time replacer in baking, Mott’s® Applesauce. I did use vegan margarine and cream cheese, but you could always choose the original versions of these if you prefer. Lastly, I created a vegan “buttermilk” using almond milk + apple cider vinegar. Works like a charm every single time! I found the Mott’s® Applesauce at my local Scottsdale, AZ Walmart in the canned fruit aisle and purchased a larger size because I love using it as a healthy substitute for oil in baking. Mott’s® Applesauce is a great better-for-you ingredient as it adds flavor and moisture while helping you cut back on the negatives (calories, fat, sodium & cholesterol). The first step in this recipe is to peel the butternut squash. A good vegetable peeler or sharp knife makes easier work of this task. Once it’s peeled, I simply used a box grater to create shreds. You’ll need about a cup of the shreds. The cake comes together in the traditional manner from this point forward. The vegan margarine and sugar are creamed together in the bowl of an electric mixer until light and fluffy. It is at this point that I add in my Mott’s® Applesauce. I like to whisk together the dry ingredients, placing them in a separate bowl. I also prepare the buttermilk mixture about 5 minutes ahead so the almond milk and vinegar create that chemical reaction we are looking for. These two are added to the mixer alternately. Remember to scrape down the sides of the bowl as you go. 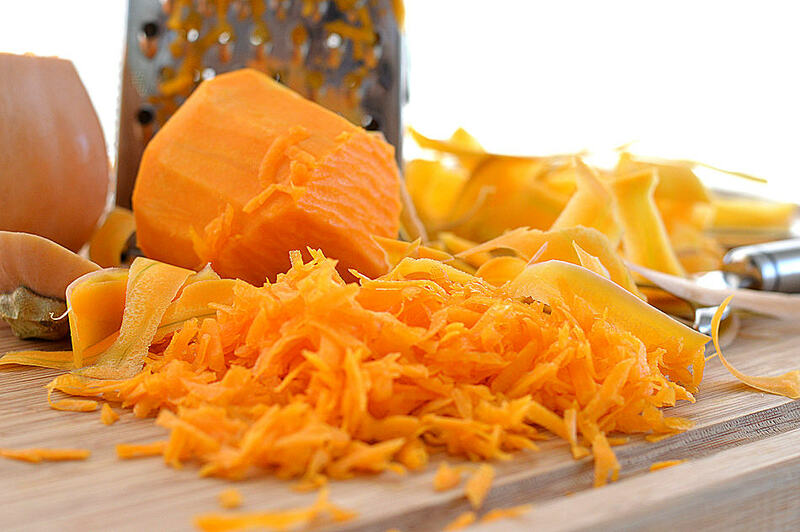 Once combined, fold in the shredded squash and chopped walnuts. I use an ice cream scoop to create uniform cupcakes and am obsessed with these natural, unbleached parchment wrappers. I think they look especially nice with this particular fall recipe. 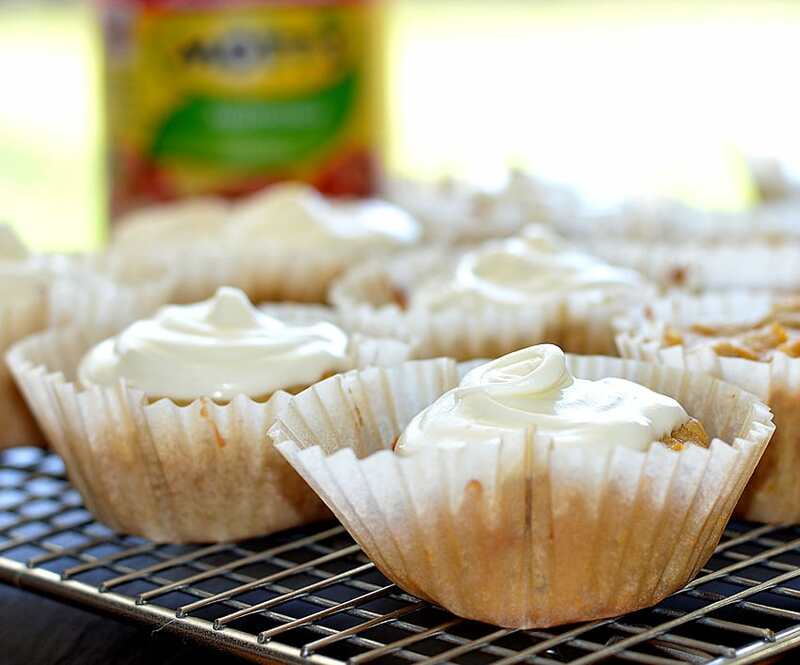 The cupcakes bake for about 15-20 minutes or until a toothpick inserted comes clean. Allow to cool completely on a wire rack. Now it’s time for the Maple Cream Cheese Frosting. In the bowl of an electric mixer, beat the vegan margarine and cream cheese on medium speed until light and fluffy. Add the powdered sugar on low speed (unless you really want to be covered in powdered sugar), adding the almond milk and maple syrup. Beat until it’s all combined, smooth and creamy. If you feel it’s a bit too thick to spread, feel free to add a bit more almond milk. Too thin? Add more powdered sugar. 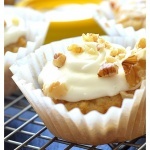 Frost the cupcakes and sprinkle with chopped walnuts. Serve immediately or cover and refrigerate to store. 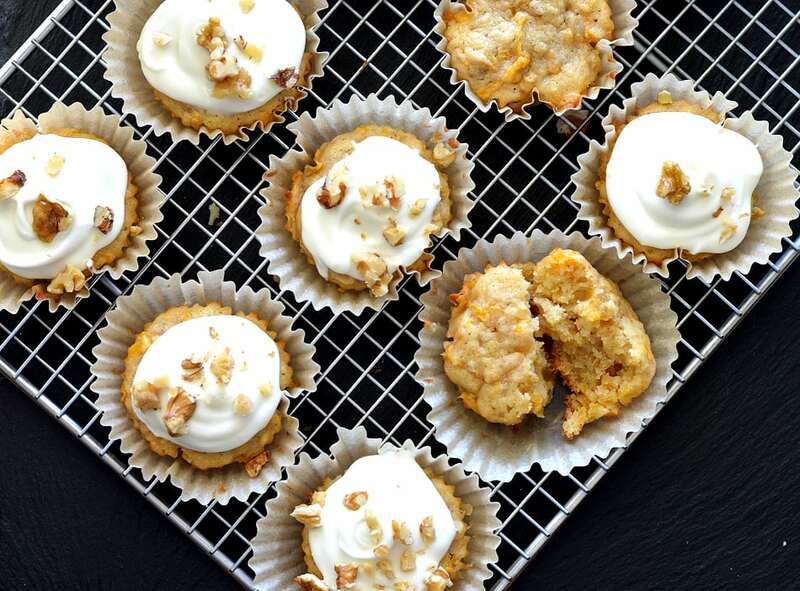 Did you make this recipe for Vegan Butternut Squash Cupcakes with Maple Cream Cheese Frosting? Let me know what you thought in the comments section below. Your comments help other readers decide whether or not to make my recipes, so I really appreciate your feedback! 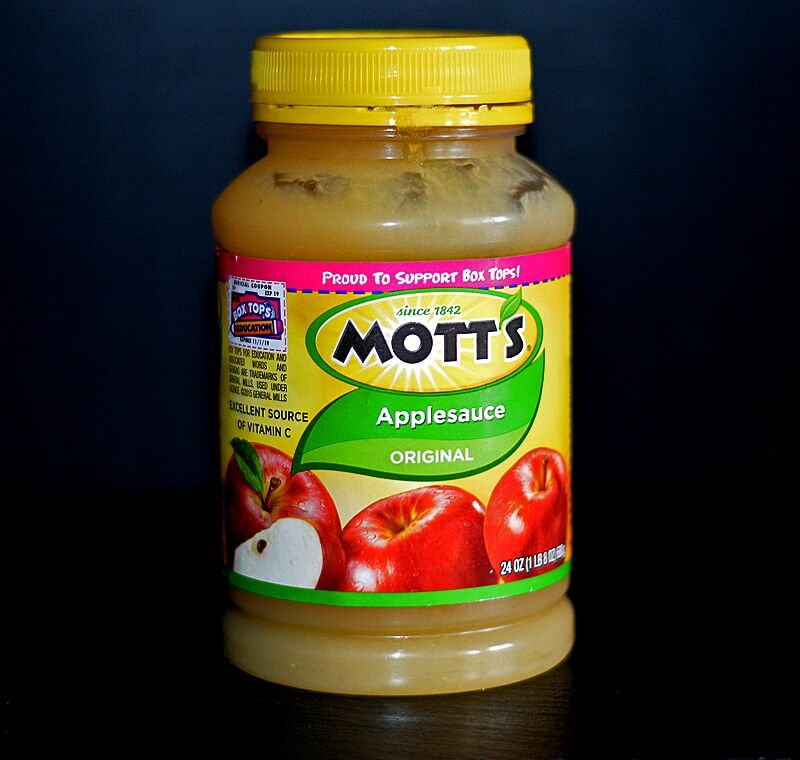 And for more information on Mott’s® Applesauce, click here to visit their website. Prepare a cupcake pan with liners and set aside. Prepare buttermilk mixture by add vinegar to almond milk and allow to sit while you get the rest of the recipe together. In the bowl of an electric mixer, add the softened margarine and sugar. Cream together until light and fluffy. Add the Mott's® Original Applesauce. Alternately add the buttermilk mixture with the dry ingredient mixture, scraping down the sides of the bowl as you go. Fold in the grated squash and walnuts by hand. Using an ice cream scoop, fill cupcake liners 3/4 full. Bake for 15-20 minutes or until a toothpick inserted comes clean. 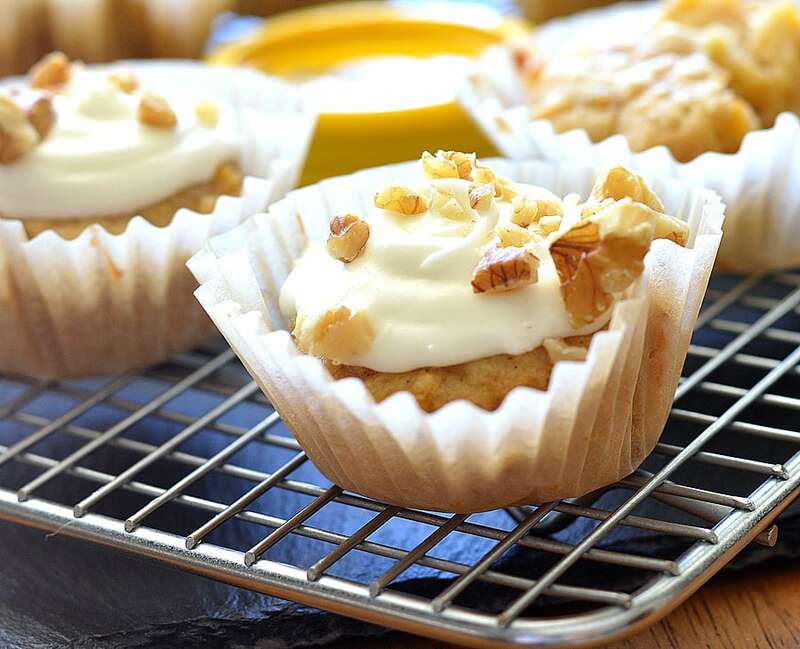 To make the maple buttercream frosting, place the cream cheese and margarine in the bowl of an electric mixer on medium speed until light and fluffy. Reduce the speed to low and add the powdered sugar, almond milk and maple syrup. Beat until smooth and creamy. If it seems to thick to spread, add more almond milk. Too thin? Add more powdered sugar. Frost the cupcakes and sprinkle with the chopped walnuts. Serve immediately or cover and refrigerate to store. Any thoughts on making this gluten free?